The USB 2.0 PC/MAC FileTransfer Cable provides a hassle-free way to transfer files between two PCs or between a PC and a MAC. 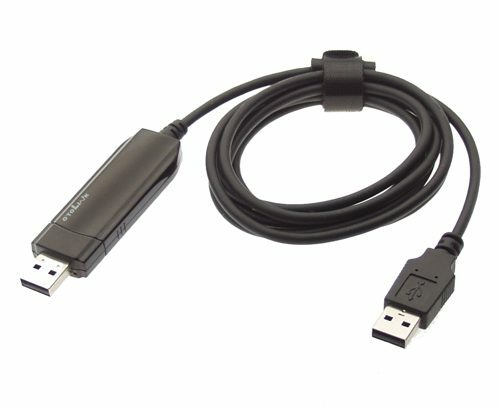 Simply plug the data transfer cable into each USB computer, and start transferring your files (program data files, photos, music, videos), emails, and settings from your old system to your new. Data transfer rate: 16 MB/sec (Megabyte-per-second). Two male USB Type A connectors. Dual data buffer supporting two-way data transfer. No file size or media capacity limitations. Software embedded on the USB file transfer cable – loads automatically. Supports Windows 2000/XP/Vista/7 and MAC OS v10.4 or later.